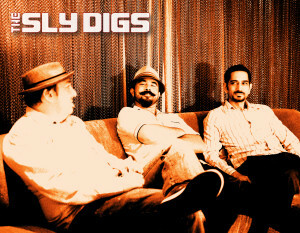 The Sly Digs have birthed a roguish fusion of music across a vast demographic landscape, without catering to the lowest common denominator. Based in Long Beach, CA, they have created their own genre, Sly Fi, by incredibly melding a homogenous blend of spaghetti western, punk rock, surf, rockabilly, garage, outlaw country, beef, cheese, and good old fashioned rock and roll. Indeed, their album, “1000 Voices and a One Track Mind” is exactly that, intricately weaving those 1000 voices into a fine tapestry. They continue to evolve and flourish with their intriguing style, while working on their second album. They have also released two EP’s since their inception, 2008’s “Eee Pee, and 2012’s “Drunk Dial”. The Sly Digs have appeared on stage with members of Jane’s Addiction, Fishbone, Snoop Dog, The Minutemen, fIrehose, and Wilco, as well as renowned stage artist Norton Wisdom. Look for their first single, “Drunk Dial” featured on independent radio stations nationwide.